Australian Bauxite Limited (ASX:ABX) had produced 31,600 tonnes as at Monday 9 April and achieved the contracted tonnage target of 30,000 to 33,000 of cement-grade bauxite 3 weeks before the 1 May 2019 contract date. Grades are better than contract, as usual for ABx shipments to date. Emerging bauxite producer, Australian Bauxite Limited (ASX:ABX) considers its Binjour Project located 115kms southwest of Bundaberg Port to be the best source of gibbsite-trihydrate bauxite in Queensland that is suitable for low-temperature alumina refineries and sweetener circuits in some high-temperature refineries. 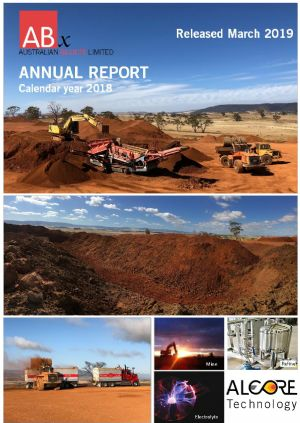 Australian Bauxite Ltd (ASX:ABX) provides the Company&apos;s 2018 Annual Report for the 12 month period to 31 December 2018. Australian Bauxite Limited (ASX:ABX) is pleased to advise that it has been the successful tenderer for its next sale of seaborne cement-grade bauxite. Australian Bauxite Ltd (ASX:ABX)(FRA:A7B) (ABx)&apos;s wholly-owned subsidiary, ALCORE Limited has acquired the equipment needed to produce test samples of key products and constructed the Stage 1 Core Laboratory to lock-up stage, thus staying ahead of schedule and within budget. In accordance with the requirements of Listing Rule 3.1 Australian Bauxite Ltd (ASX:ABX) submit the attached material that was presented at the 2018 Mining Resources Convention. Australian Bauxite Ltd (ASX:ABX) provides the Company&apos;s Quarterly Report. In accordance with the requirements of Listing Rule 3.1 Australian Bauxite Ltd (ASX:ABX) submit the attached material is being presented at the 2018 Mining Resources Convention. Australian Bauxite Limited (ABx)&apos;s (ASX:ABX) wholly-owned subsidiary, ALCORE Limited has completed the design phase of the Stage 1 project on schedule and has commenced acquiring the equipment for production to commence before year-end, ahead of schedule. Australian Bauxite Ltd (ASX:ABX) provides the Company&apos;s Half Yearly Report. Australian Bauxite Limited (ASX:ABX) is pleased to announce that its wholly-owned subsidiary, ALCORE Limited will have global licence rights for bauxite refining using the ALCORE technology. 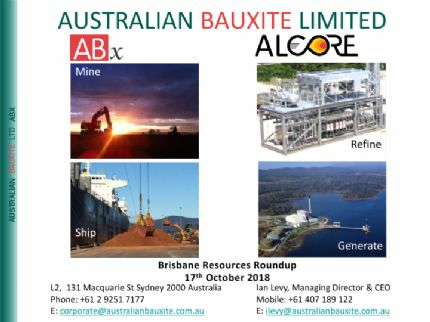 Australian Bauxite Limited (ASX:ABX) is pleased to announce that its wholly-owned subsidiary, ALCORE Limited has secured the minimum funding needed to commence Stage 1 of the ALCORE Project. Site construction works commenced on 1 July as planned at ALCORE&apos;s pre-approved Pilot Plant site in Berkeley Vale, Central Coast NSW for the production of AlF3 test samples. Australian Bauxite Limited (ASX:ABX) is pleased to advise that Australian Bauxite Limited and Aziz Group of Bangladesh have successfully negotiated a Letter of Intent over two important opportunities for bauxite sales and future business development. Emerging bauxite producer, Australian Bauxite Limited (ASX:ABX) holds tenements covering the core of the Eastern Australian Bauxite Province. ABx considers its Binjour Project located 115kms southwest of Bundaberg Port to be a discovery of a major bauxite province which is being assessed to become the company&apos;s flagship project over the next 5 years. Australian Bauxite Ltd (ASX:ABX) provides the Chairman&apos;s Address to AGM 2018. In accordance with the requirements of Listing Rule 3.1 Australian Bauxite Ltd (ASX:ABX) submit the attached material being presented to investors to the ALCORE project. Bauxite producer, Australian Bauxite Limited (ASX:ABX) has made significant progress with its ALCORE project which is the development of bauxite beneficiation and refining technology to produce the high-value Aluminium Fluoride used in aluminium smelters and Lithium Ion batteries. Australian Bauxite Ltd (ASX:ABX) provides the Company&apos;s Quarterly Activities Report for three months to 31 March 2018. Australian Bauxite Ltd (ASX:ABX) provides the Company&apos;s 2017 Annual Report. Bauxite producer, Australian Bauxite Limited (ASX:ABX) has made significant progress with its ALCORE project which is the development of bauxite beneficiation and refining technology to produce the highvalue Aluminium Fluoride used in aluminium smelters and Lithium Ion batteries. Australian Bauxite Ltd (ASX:ABX) provides the Company&apos;s Quarterly Report and Activities Statement for the period ending 31 December, 2017. Bauxite producer, Australian Bauxite Limited (ASX:ABX) is reporting progress on the ALCORE project in accordance with the schedule announced to the ASX on 13th November 2017. Bauxite producer, Australian Bauxite Limited (ASX:ABX) is pleased to announce that it has finalised a Heads of Agreement with technology provider, Refined Ore Industries Limited for the ALCORE project which is the development of bauxite beneficiation and refining technology to produce from bauxite Aluminium Fluoride which is used in aluminium production and in lithium ion batteries. Australian Bauxite Ltd (ASX:ABX) provides the Company&apos;s Quarterly Report and Activity Statement for three months to 30 September 2017. In accordance with the requirements of Listing Rule 3.1 Australian Bauxite Ltd (ASX:ABX) submit the attached material being presented at the TechKnow Invest Roadshow in Melbourne and Sydney. 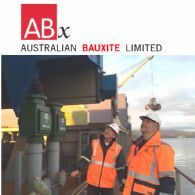 Loading of the next two bauxite cargoes of bauxite producer, Australian Bauxite Limited (ASX:ABX) commenced at Berth 6, Bell Bay Port, Tasmania on 21st October. The ship, MV Marianna is scheduled to depart on 24th October. Ship scheduling and associated logistics in making the cargoes available have gone smoothly, with ABx delivering the two cargos weeks ahead of deadlines. Bauxite producer, Australian Bauxite Limited (ASX:ABX) has received the first part payment for its 30,000 tonne bauxite cargo totalling $1.73 million. The customer will pay the remainder on proof of weight via ship&apos;s survey in the coming weeks. Bauxite producer, Australian Bauxite Limited (ASX:ABX) has completed the 30,000 tonne bauxite cargo and has invoiced the customer today. The customer will pay 90% of the invoice value immediately and the remainder on proof of weight via ship&apos;s survey. Australian Bauxite Ltd (ASX:ABX) provides the Company&apos;s Half Yearly Report and Accounts for the half-year ended 30 June 2017. Emerging bauxite producer, Australian Bauxite Limited (ASX:ABX) is pleased to announce that it has made an application in conjunction with its marketing partner, Rawmin for a Regional Jobs and Investment grant for the commencement of the Binjour Bauxite Project in the Wide Bay Burnett region of central Queensland. Australian Bauxite Ltd (ASX:ABX) provides the Company&apos;s Quarterly Report and Activity Statement for Three Months to 30 June, 2017. Emerging bauxite producer, Australian Bauxite Limited (ASX:ABX) is pleased to announce that its next bauxite sale has been confirmed. 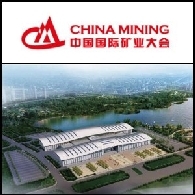 Australian Bauxite Limited (ASX:ABX) and its marketing partner, Rawmin Mining and Industries Pvt. Ltd commenced a review in late May of ABx&apos;s bauxite resources around Binjour totalling 28 million tonnes. Binjour is located 115kms from the export port of Bundaberg which is similar scale to the port used by Rawmin in India to export its bauxite to long-term customers. Over the past 18 months Australian Bauxite Ltd (ASX:ABX) has increased its capacity to supply cement-grade bauxite whilst remaining ready to sell metallurgical grade bauxite when prices improve. Current trends in the metallurgical grade Chinese markets are encouraging and Australian Bauxite Ltd (ASX:ABX) is beginning to engage with potential customer refineries - but current prices still need to rise a bit yet. 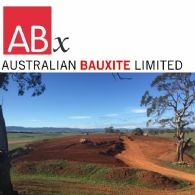 Australian Bauxite Ltd (ASX:ABX) has received a letter of intent for a significant shipment of cement grade bauxite from its Bald Hill Bauxite Project near Campbell Town, northern Tasmania. Australian Bauxite Ltd (ASX:ABX) is pleased to provide the attached material being presented at the RIU Sydney Resources Round Up being held at the Sofitel Sydney Wentworth Hotel on 10 & 11 May, 2017. Australian Bauxite Ltd (ASX:ABX) is pleased to provide the Company&apos;s March 2017 Quarterly Activities Report. Australian Bauxite Ltd (ASX:ABX) is pleased to provide the Company&apos;s Annual Report to shareholders for the year ended 31 December, 2016. 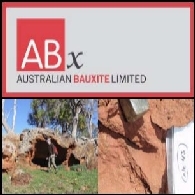 Australian Bauxite Ltd (ASX:ABX) is pleased to provide an exploration update. 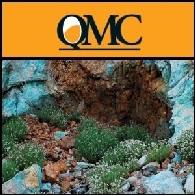 High quality refractory-grade bauxite discovered inland of Port Kembla ABx has discovered a layer of refractory-grade bauxite in Penrose state pine forest, adjacent to the Hume Highway, 90 kilometres from Port Kembla. Australian Bauxite Ltd (ASX:ABX) is pleased to provide the Company&apos;s Quarterly Activities Report for three months ended 31 December, 2016. Australian Bauxite Ltd (ASX:ABX) (ABx) currently sells bauxite into cement and fertiliser markets at prices higher than could be achieved in the over-supplied metallurgical bauxite market. ABx and contractor Stornoway have blended more than 33,000 tonnes of final product at the Bald Hill bauxite project in northern Tasmania to meet the exact specification of its next two customers. One sale is booked for December and the second sale booked for around year-end is awaiting completion of a 90-tonne bulk test to ensure that ABx bauxite produces cement that meets the highest standards. In accordance with the requirements of Listing Rule 3.1 Australian Bauxite Ltd (ASX:ABX) submit the attached material being presented at the RIU Resources Investor Roadshow in Sydney and Melbourne. Australian Bauxite Ltd (ASX:ABX) (ABx) is selling bauxite into fertiliser and cement markets at prices higher than the currently over-supplied metallurgical bauxite market. ABx&apos;s sales of Cement-Grade bauxite in 2016 to date total 42,005 tonnes. Australian Bauxite Ltd (ASX:ABX) are pleased to provide the Company&apos;s Half Yearly Report and Accounts for the half-year ended 30 June 2016. Australian Bauxite Limited (ABx)&apos;s (ASX:ABX) Fingal Rail Bauxite Project in northern Tasmania has proven to be ideal for production of cement-grade bauxite for rail transport and export from Bell Bay Port. 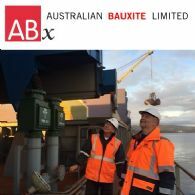 Australian Bauxite Limited (ASX:ABX) (ABx) second shipment, comprising 35,913 tonnes of cement-grade bauxite has been loaded and the ship has departed Bell Bay Port in northern Tasmania, thus concluding the second and largest sale of bauxite from ABx&apos;s Bald Hill mine. 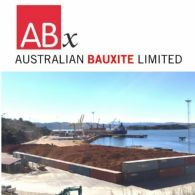 Australian Bauxite Ltd (ASX:ABX) and its operations contractor, Stornoway, have made arrangements to restart the Bald Hill Bauxite Project at Campbell Town, Northern Tasmania on 8 August 2016 t o continue with routine rehabilitation and t o commence assembling the next 3 bauxite lots for sale, including a large ship load, planned for shipping in late Spring. 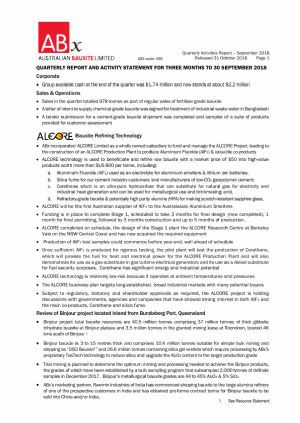 Australian Bauxite Limited (ASX:ABX) Quarterly report & activities statement dated 24 July 2016 for 3 months to 30 June 2016. Australian Bauxite Limited (ASX:ABX) (ABx) is selling bauxite into fertiliser and cement markets at prices higher than the currently over-supplied metallurgical bauxite market. ABx&apos;s maiden shipment of 5,557 tonnes occurred on 28 April and a second sale of 5,000 tonnes was announced on 31 May. Australian Bauxite Limited (ABx)(ASX:ABX) maiden shipment of 5,557 tonnes of cement-grade bauxite has been loaded overnight and the ship has left Bell Bay Port in northern Tasmania, thus concluding the first sale of bauxite from ABx&apos;s Bald Hill mine - the first new bauxite project in Australia for more than 35 years. Australian Bauxite Limited (ASX:ABX) has started its first bauxite mine in Tasmania and holds the core of the Eastern Australian Bauxite Province. ABx&apos;s 37 bauxite tenements in Queensland, New South Wales & Tasmania exceed 5,000 km2. Australian bauxite explorer, Australian Bauxite Limited (ABx) (ASX:ABX), has been granted its first mining lease, ML1961 at its Bald Hill Project in Northern Tasmania. Bald Hill is located 60 kms southwest of Launceston. 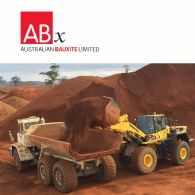 Australian Bauxite Ltd (ASX:ABZ) State One Stockbroking recently released a research report covering Australian Bauxite Limited. Australian Bauxite Limited (ASX:ABZ) has established a virtual data room in response to approaches made since its declaration of three State-Significant Projects (ASX 27 September 2012). Bauxite development company, Australian Bauxite Limited (ASX:ABZ) has completed investigative drilling as part of its due diligence with respect to Mining Lease ML80126, located 25 km south of Mundubbera and 155 km southwest of Bundaberg Port in central Queensland. ABx confirms that the Inferred Resource of bauxite identified is 3.5 Million tonnes. Emerging bauxite development company, Australian Bauxite Limited (ASX:ABZ) has bauxite tenements totalling more than 7,500 km2 covering the core of the Eastern Australian Bauxite Province. ABx considers its Tasmanian Project located within 100 km of Bell Bay Port to be a state significant discovery of a major bauxite province, which may come into production ahead of ABx&apos;s other mainland projects. 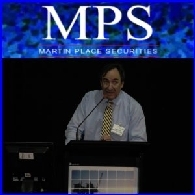 Australian Bauxite Limited (ASX:ABZ) ABZ CEO Ian Levy presents at Mining 2012 Resources Convention. 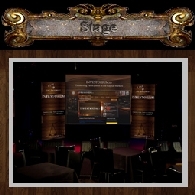 The presentation can be downloaded. Australian Bauxite Limited (ASX:ABZ) has released a webcast with CEO Ian Levy regarding ABz&apos;s Three State-Significant Projects. Emerging bauxite development company, Australian Bauxite Limited (ASX:ABZ) has received a Pre-Feasibility Study (PFS) report by Como Engineers and a Stage 2 Mine to Port Logistics Study by GHD for the Goulburn Bauxite Project in Southern New South Wales. Whilst this work was in progress, ABx discovered the thickest bauxite ever found in Australia at Mt Rae 40km north of Goulburn, expanded resources at Binjour in central Queensland and discovered several bauxite deposits in Tasmania in viable locations near Bell Bay deepwater mineral export port. 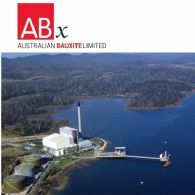 Australian Bauxite Limited (ASX:ABZ) has released a webcast with CEO Ian Levy in regards to &apos; ABx Generates Positive Early Indications from Tasmanian Exploration Program&apos; - Audio Interview. Emerging bauxite development company, Australian Bauxite Limited (ASX:ABZ) is drilling ahead of schedule in Tasmania at Bauxite Deposit DL-130 located 65km south-south-west of Bell Bay deepwater port in a privately owned plantation that is under harvest. Thicker than expected bauxite has been encountered up to 6 metres thick over a wide area which suggests that with this project could commence production earlier than anticipated with minimal impacts, returning the land to plantation timber after extracting the surface layer of bauxite and replacing the thin soil layer. Australian Bauxite Limited (ASX:ABZ) is an emerging bauxite exploration and development company, which listed on the Australian Securities Exchange (ASX) on 24 December 2009 with the ASX Code ABZ. This Review of Operations covers the period to 30 June 2012. 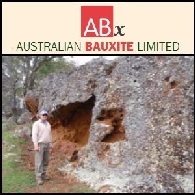 Australian Bauxite Limited (ASX:ABZ) announce the quarterly report is dated 30 July 2012 and is for the three months to 30 June 2012. Australian Bauxite Limited (ASX:ABZ) Australian Bauxite Limited advises that it has released a webcast with CEO Ian Levy. 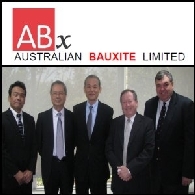 Australian Bauxite Limited (ASX:ABZ) advises that it has released a webcast with CEO Ian Levy. The interview can be heard on the ABx website on the NEWS|MEDIA page. 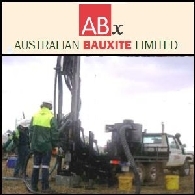 Emerging bauxite exploration and development company, Australian Bauxite Limited (ASX:ABZ) has received laboratory and exploration results from drilling and surface exploration at its newly consolidated 11 Tasmanian exploration tenements totalling 1,897 square kilometres in central Northern Tasmania. Australian Bauxite Limited (ASX:ABZ) (ABx) is pleased to announce it has raised A$455,850 via a Share Purchase Plan ("SPP"), which ran in conjunction with a placement to sophisticated, eligible and/or professional investors. Emerging bauxite exploration and development company, Australian Bauxite Limited (ASX:ABZ) has bauxite tenements totalling more than 8,700 km2 covering the core of the Eastern Australian Bauxite Province. ABx considers its Binjour Project located 100kms from Bundaberg Port to be a state significant discovery of a major bauxite province which may well become the company&apos;s flagship project over the next 5 years. 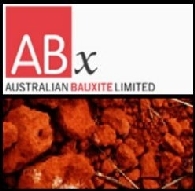 Australian Bauxite (ASX:ABZ) Announce State One Stockbroking Analyst Report. Goulburn-Taralga up 50% to 37.9Mt, global resources at 98.7Mt. 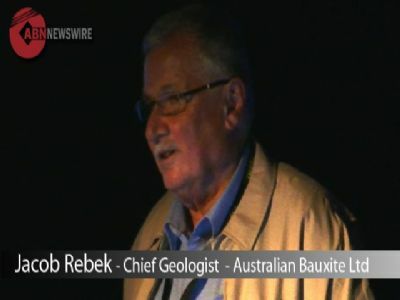 Australian Bauxite Limited (ASX:ABZ) advises that it has released a webcast with CEO Ian Levy. Mr. Levy speaks on the latest announcement regarding the Extended Binjour Bauxite Project. 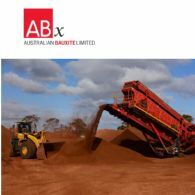 Australian Bauxite Limited (ABx) (ASX:ABZ) announced a Share Purchase Plan (SPP) offering eligible shareholders the opportunity to purchase shares in ABx without brokerage or other related charges. Emerging bauxite exploration and development company, Australian Bauxite Limited (ASX:ABZ) has received laboratory and exploration results from drilling and surface exploration at its Binjour Bauxite Project in central QLD. Australian Bauxite Limited (ASX:ABZ) advises that is has completed a placement of 4.3 million fully paid ordinary shares at $0.39 cents per share to sophisticated, eligible and/or professional investors, as defined under Section 708 of the Corporations Act (Placement). Emerging bauxite exploration and development company, Australian Bauxite Limited (ASX:ABZ) has 40 bauxite tenements totalling more than 8,700 km2 covering the core of the Eastern Australian Bauxite Province. Australian Bauxite Limited (ASX:ABZ) commissioned Como Engineers Pty Ltd and other metallurgical and environmental engineering firms to prepare a Pre Feasibility Study (PFS) on the Goulburn Bauxite Project located near Goulburn New South Wales. 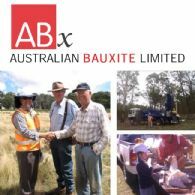 Australian Bauxite Limited (ASX:ABZ) are pleased to provide the Chairman&apos;s Address to Shareholders at the 2012 Annual General Meeting held today. 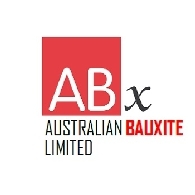 Australian Bauxite Limited (ASX:ABZ) advises that it has released a webcast with CEO Ian Levy. Emerging bauxite exploration and development company, Australian Bauxite Limited (ASX:ABZ) discovered a thick layer of good quality bauxite in 2008-09 at its Inverell project in northern NSW (see Figure 1). Parts of that bauxite lie beneath a clay horizon and required further investigation. ABx conducts thorough evaluation programmes and results from 37 new holes into the concealed bauxite are generally consistent with previous Inferred resource estimates for those zones. 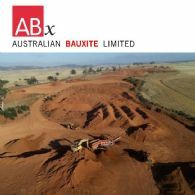 Australian Bauxite Limited (ASX:ABZ) quarterly activities statement is dated 27th April 2012 and is for the three months ending 31st March 2012. During the March quarter ABx discovered the company&apos;s thickest high-grade bauxite intersection- possibly one of the thickest bauxite intersections in Australia. Most Australian bauxite deposits are less than 4 metres thick. Australian Bauxite Limited (ASX:ABZ) is pleased to provide their CEO Presentation at the 20-20 Investor series, regarding &apos;Developing East Coast Bauxite Projects&apos;. 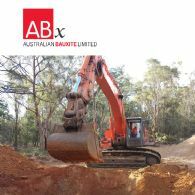 Australian Bauxite Limited (ASX:ABZ) achieved its objectives during 2011 and the outlook remains positive for 2012 as your company progresses from an explorer to a bauxite development-exploration company. Australian Bauxite (ASX:ABZ) Announce, consequent to the outstanding drilling results at Taralga, State One Stockbroking has set a price target of $1.26 for Australian Bauxite. Emerging bauxite exploration and development company, Australian Bauxite Limited (ASX:ABZ) has drilled 4 new vertical holes TG677 to TG680 around hole TG626 at Mt Rae which, in December 2011, discovered the company&apos;s then record thickest high-grade bauxite intersection - possibly one of the thickest bauxite intersections in Australia. Thicker bauxite was found. Emerging bauxite exploration and development company, Australian Bauxite Limited (ASX:ABZ) has received laboratory results from its December 2011 drilling campaign at Taralga near Goulburn, southern NSW. Results from hole TG626 at Mt Rae and several nearby holes confirmed the discovery of the company&apos;s thickest high-grade bauxite intersection - possibly one of the thickest bauxite intersections in Australia. Australian Bauxite Limited (ABx) (ASX:ABZ) is pleased to announce the appointment of Mr Dawkins A.O. as an independent Director to the Board. Australian Bauxite Limited (ASX:ABZ) says today Mr Levy will be presenting at the Mining 2011 Resources Convention at 5:10 pm today. Emerging bauxite exploration and development company, Australian Bauxite Limited (ASX:ABZ) has discovered a thick layer of very high quality bauxite at its Binjour project in central QLD. The bauxite lies beneath a clay horizon. Results from 88 holes into the bauxite are generally exceptionally high grade, thick gibbsite bauxite, ideal as a "sweetener" to any bauxite refinery. ABx refers to such high grade bauxite as "Brown Sugar" which commands a large price premium. Australian Bauxite Limited (ASX:ABZ) (ABx) and Marubeni Corporation (TYO:8002) (Marubeni) have concluded a Memorandum of Understanding to jointly conduct a pre-feasibility study in relation to the Goulburn-Taralga bauxite project located in New South Wales, Australia. Emerging bauxite exploration and development company, Australian Bauxite Limited (ASX:ABZ) has received laboratory results from drilling at its Binjour project in central QLD. Emerging bauxite exploration and development company, Australian Bauxite (ASX:ABZ) has discovered a thick layer of bauxite at its Guyra project in northern NSW. The bauxite lies near surface beneath a thin clay horizon. Results from 71 holes into the bauxite include some exceptionally high grade, thick gibbsite bauxite, ideal as a "sweetener" to any bauxite refinery. Australian Bauxite Limited (ASX:ABZ) CEO, Ian Levy, was interviewed by Sky News Australia with respect to the Company&apos;s progress and expanding resource base. Emerging bauxite exploration and development company, Australian Bauxite Limited (ASX:ABZ) has received laboratory results from drilling at its Guyra project in NSW. Australian Bauxite Limited (ASX:ABZ) Chief Executive Officer, Ian Levy, discusses the progress of Australian Bauxite with Finance News Network. 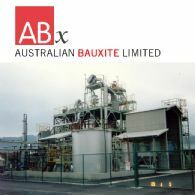 Australian Bauxite Limited (ASX:ABZ) release Chairman&apos;s Address to 2011 Annual General Meeting. Australian Bauxite Limited (ASX:ABZ) has 33 bauxite tenements in eastern Australia covering more than 7,500 km2. To clarify the marketability of the bauxite types found in the Taralga-Goulburn-Crookwell area in southern NSW, detailed drilling was recently conducted at spacings of approximately 100 metres in areas containing easily mined bauxite zones of Direct Shipping Ore grades because Taralga is located near a major railway line leading directly to Port Kembla export terminal. 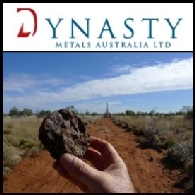 Dynasty Metals Australia Limited (ASX:DMA) refers to its announcement to ASX on 9 March 2011 (9 March Announcement) which included a director statement from Messrs Ian Levy, Malcolm Carson and Graham Anderson also dated 9 March 2011 (Director Statement). Emerging bauxite exploration and development company, Australian Bauxite Limited (ASX:ABZ) has received laboratory results from the last 14 holes drilled at its Binjour project located between Gayndah and Mundubbera, south of Gladstone in central Queensland. Emerging bauxite exploration and development company, Australian Bauxite Limited (ASX:ABZ) has commenced an aggressive 2011 drilling campaign on schedule today in good weather at its fast developing bauxite project at Taralga, near Goulburn, southern NSW. Ian Levy has thirty years senior management experience with small to large mining companies, including WMC, Pancontinental Mining, Gympie Gold and CEO of Allegiance Mining, involving development of bauxite, gold, coal, base metals, nickel and industrial minerals projects from discovery to marketing. Australian Bauxite Limited (ASX:ABZ) has 32 bauxite tenements in eastern Australia covering more than 7,500 km2 and is near to completing first-pass exploratory drilling of all project areas during calendar year 2010 - 6 months ahead of schedule. Emerging bauxite exploration and development company, Australian Bauxite Limited (ASX:ABZ) has received all laboratory results from the first pass drilling campaign at its Binjour Project south of Gladstone and 170km southwest of Bundaberg, central Queensland. Australian Bauxite Limited (ASX:ABZ) has 30 bauxite tenements in eastern Australia covering more than 7,100 km2 and is well advanced in its program to complete first-pass exploratory drilling of all project areas during calendar year 2010 - 6 months ahead of schedule. Australian Bauxite Limited (ASX:ABZ) has increased the Inferred and Indicated Resources of its bauxite deposit A-B by 64% to 36 million tonnes of gibbsite-rich bauxite in tenement EL 6997 at Inverell in northern NSW. Australian Bauxite Limited (ASX:ABZ) advises that is has completed a placement of 13.50 million fully paid ordinary shares (15.77% of its issued capital) at 45 cents per share to sophisticated, eligible and/or professional investors, as defined under Section 708 of the Corporations Act, raising A$6,075,000 before costs. At ABx&apos;s northernmost bauxite deposit at Binjour in central QLD, encouraging thicknesses of a concealed bauxite layer up to 15 metres thick were encountered and two-stages of drilling were completed in July. A thick bauxite layer has been discovered at Binjour with early assays indicating high qualities. Emerging bauxite exploration and development company, Australian Bauxite Limited (ASX:ABZ) has successfully completed its first-pass drilling campaigns on all of its QLD projects and its second-pass drilling campaign at Inverell in northern NSW along with a first-pass exploratory drilling of Pindaroi near Inverell. Early laboratory results from orientation samples are reported here for Binjour, Inverell, Pindaroi and Hampton tenements. 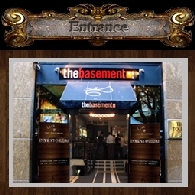 Results are considered satisfactory, and, in some places, better than expected. Drilling is continuing ahead of schedule in southern NSW near Goulburn with a high success rate. 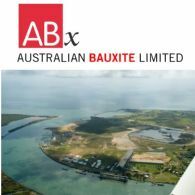 Australian Bauxite Limited (ASX:ABZ) is pleased to announce its quarterly report for the period ended 30 June 2010. Emerging bauxite exploration and development company, Australian Bauxite Limited (ASX:ABZ) has successfully completed its exploratory drilling programs at Hampton in southern QLD and first-pass reconnaissance drilling of its northernmost bauxite deposit at Binjour in central QLD where encouraging thicknesses of bauxite were encountered. 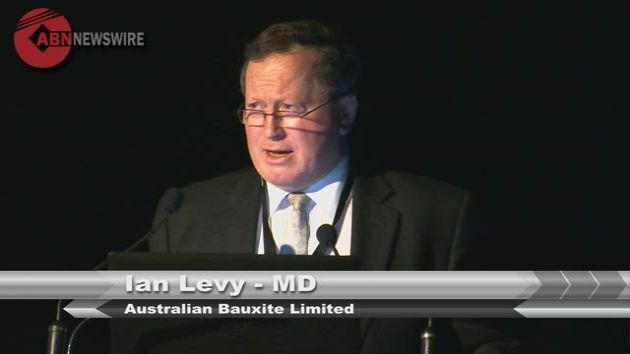 FINANCE AUDIO: Australian Bauxite Limited (ASX:ABZ) CEO, Ian Levy Speaks At The AMEC Convention 2010, Perth WA. Since successfully listing on the ASX on 24 December 2009, Australian Bauxite Limited (ASX:ABZ) has established itself as a new force in the Australian bauxite industry. It commenced an aggressive drilling program in April this year that will continue for some time and has already begun to deliver positive bauxite results in Inverell-Pindaroi in northern NSW and Pechey-Hampton in southern Queensland that were announced two days ago. Emerging bauxite exploration and development company, Australian Bauxite Limited (ASX:ABZ) has successfully completed its current exploratory drilling program at Inverell-Pindaroi in northern NSW. 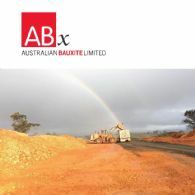 Australian Bauxite Limited (ASX:ABZ) has released its quarterly report which is dated 22nd April 2010 and is for the three months ending 31 March 2010. Australian Bauxite Limited (ASX:ABZ) advises that is has completed the placement of 10 million fully paid ordinary shares (14.29% of its issued capital) at 35 cents per share to institutional and sophisticated investors, as defined under Section 708 of the Corporations Act, raising A$3.5 million before costs. The Directors of Australian Bauxite Limited (ABx)(ASX:ABZ) are pleased to advise that it has finalised a placement of 10 million fully paid ordinary shares at 35 cents per share raising A$3.5 million before costs. Emerging Australian bauxite company, Australian Bauxite Limited (ASX:ABZ) has applied for eight (8) new bauxite exploration tenements in Tasmania covering an area totalling 1,508 square kilometres (km2) and containing good quality bauxite in favourable settings for potential development - see Figure 1 & Table 1 for details. 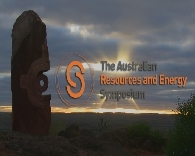 VIDEO: Australian Bauxite (ASX:ABZ) CEO Ian Levy Speaks With Brian Carlton at Symposium Resources Roadshows. ABx was incorporated on 23rd September 2009 and was formed specifically for the purpose of acquiring the bauxite interests of Hudson Resources Limited. 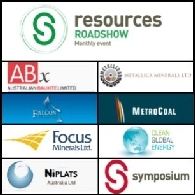 The Symposium Resources Roadshows are off to a cracking start for 2010 with the first in the series beginning next week on the 16th February in Sydney and in Melbourne on the 17th February. ABN Newswire stocks to watch today include: Galaxy Resources Limited (ASX:GXY) (PINK:GALXF), Otto Energy Limited (ASX:OEL), Australian Bauxite Limited (ASX:ABZ), Coalspur Mines Limited (ASX:CPL) (PINK:CSPZF), Havilah Resources NL (ASX:HAV) and Fufeng (HKG:0546) (OTC:FFNGY). Australian Bauxite Limited (ASX:ABZ) has 17 bauxite exploration tenements in eastern Australia covering over 5,000 sq kms. A small area of one tenement, EL 6977 at Inverell in northern NSW, has been drill tested by 118 holes totalling 1,773 metres. The drilling has only evaluated 15% to 30% of bauxite Deposit A-B which has been mapped for 4.6 kilometres to date and is open to the north and west. Australian Bauxite Limited (ASX:ABZ) is pleased to provide a Quarterly Activities Report for the period ended 31 December 2009. AUDIO: Australian Bauxite Limited (ASX:ABZ) was incorporated late in 2009 specifically for the purpose of acquiring the bauxite interests of Hudson Resources Limited. The proposal was to increase the portfolio through a staged development program in each of three bauxite provinces which will include exploration, sampling, drill testing and analysis from a wider range of targets on all exploration tenements. ABN Newswire stocks to watch today include: Focus Minerals Limited (ASX:FML), Australian Bauxite Limited (ASX:ABZ), Image Resources (ASX:IMA) (PINK:IMREF), Coalspur Mines Limited (ASX:CPL) (PINK:CSPZF) and FerrAus Limited (ASX:FRS) (PINK:FRRAF). 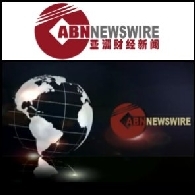 ABN Newswire stocks to watch today include: Benitec Limited (ASX:BLT)(PINK:BNIKF), Meteoric Resources NL (ASX:MEI), Magnetic Resources NL (ASX:MAU) and Australian Bauxite Limited (ASX:ABZ). 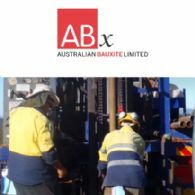 Australian Bauxite Limited (ASX:ABZ) has received advice from Queensland Mines and Energy that title in all the Queensland ABx Project Tenements have been transferred from Hudson Resources Limited to ABx3 Pty Ltd, a wholly owned subsidiary of ABx. 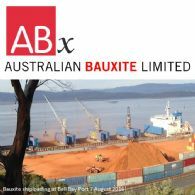 Australian Bauxite Limited (ASX:ABZ) was admitted to the Official List of ASX on Monday, 21 December 2009. Official Quotation of ABZ securities will comence at 11:00 am AEDT on Thursday, 24 December 2009.